Shreya – I’m a highly qualified Delhi girl earning an enviable salary. My parents are having a tough time finding a suitable groom for me. However, recently they have a proposal from this very interesting guy from Mumbai. I almost get mesmerised when he starts talking to me. I think I like him very much. Kunal – I’m owner of a textile company in Mumbai. My mom wants me to get married. Again. She has recently suggested a suitable girl from Delhi. What my mom doesn’t know is that I’ve already met Shreya before once in my life and I’ve been looking for her ever since. I have a vendetta to settle. A pretty damsel with a handsome hunk, flowers, wine – the ingredients to a romantic fairytale. But our two headstrong protagonists stand tall facing opposite directions, just like their thoughts, which go poles apart. I actually loved this cute promo of the book. I am a big fan of romantic fiction and so when this book was offered, it instantly caught my interest. The story, I would say is like a Bollywood film. The first half sees Shreya and Kunal being fixed in matrimony by their families. Like every girl, Shreya too nurtures a dream of meeting her knight in shining armour. So when, she hears the sophisticated and suave Kunal from Mumbai on phone, his enigmatic voice almost instantly sweeps her heart away. They say, love is blind and the feeling is so strong that Shreya doesn’t even mind her one abrupt face to face interaction with her hubby to be. The ghosts of their past come to haunt Shreya and Kunal on their wedding night. Shreya, oblivious of the fact that Kunal is the same person who she settled her scores with years ago, is shocked at the devil reveal his true face in Kunal on her first night. For Kunal however, Shreya is that one storm which blew away all the love and happiness from his life years ago. 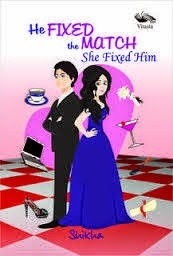 His only aim in life to spoil each and every moment of Shreya’s life and make her suffer the way he did years ago. Halfway through the book, the story takes a leap from love to hatred and revenge. The poor reader secretly wishes for things to end on a happy note for this angry young couple. However, that is when the story, just like some impatient movie scripts starts losing its sheen. The more Shreya and Kunal try to be opposites, the more opposites attract. Love gradually springs, however, everything starts getting so predictable that the reader wonders if there were some more twists and turns. If you love romcoms, the book is for you. Enjoy every scene as if you are watching a soap or a movie and don’t apply much brains in the story. Being a debut, the author deserves appreciation for her hard work in the brilliant portrayal of the love hate relationship, however, the applaud would had been a tad louder had there been some more effort towards making the second half less predictable. However, this is something almost all romcoms fall prey to n I hope with such an expressive style, the author will surely impress us with her books. I just found the cover too cute. Also the first half kept me totally engrossed. Despite being a debut, the portrayal of emotions and relationship is appreciable. Towards the end, the story got very predictable and I was telling myself what would happen next as I proceeded. Some fine tuning by the editor would have made the experience more interesting sans the drag towards the climax. Shikha Kumar has a BTech degree in Computer Science and is a manager with TCS. She enjoys travelling, reading writing and watching movies. This is her first attempt to present her writing abilities to the world. I received a copy from the author for my honest review. writing and watching movies. This is her first attempt to present her writing abilities to the world.